Can One Day Without Cars Really Change Our Travel Habits? It is said that on average, we take 66 days to form a new habit. So when an initiative sets out to change our habits in just 24 hours, there’s cause for scepticism. World Car-Free Day aims to do just that. The thought is that by closing city centres to cars for one day a year, people will make a long-term switch to alternative modes of transport and help us to address the many problems caused by our dependence on cars. 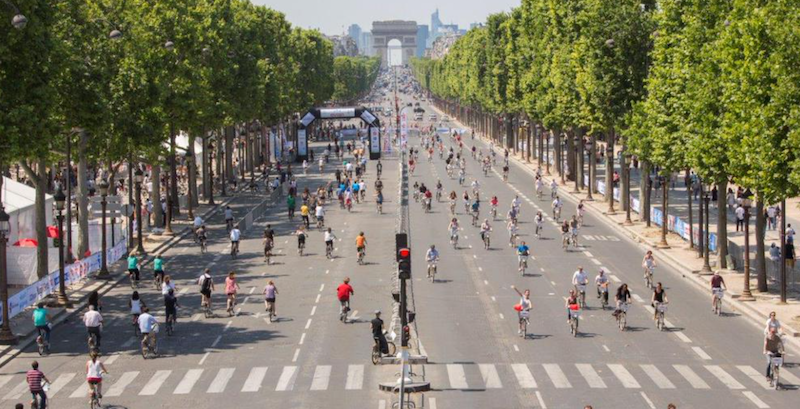 Car-free days have been running for almost 20 years, with cities as far afield as Washington, Paris, Brussels, Stockholm and New Delhi participating. And though the impact of these initiatives has not been well evaluated, there are studies which suggest that events which disrupt the transport system can lead to longer term behaviour changes. Strikes and road closures, for example, force people to try something different, and alter their knowledge and perceptions of the travel alternatives on offer. One worldwide 2002 study of over 70 road closures due to natural disasters and planned roadworks found that, on average, 11% of vehicles previously using the road could not be found in the surrounding area afterwards. A more recent study on the impact of strike action on the London Underground in February 2014 used data from travel cards to examine travel patterns before, during and after the strike. It found that 5% of travellers carried on using their newly discovered routes after the disruption was over. While these findings sound encouraging, it’s worth questioning whether the changes to travel patterns after a disruption are any greater than the day-to-day variability we see anyway. And if they are, there’s still no guarantee that enough people maintain these changes for long enough to alter overall travel patterns, such as the total kilometres driven from one year to the next. A three-year study on these topics confirmed that individual travel patterns undergo significant day-to-day and year-to-year churn. For instance, although over half of those who were asked by the researchers before and after the 2012 Olympics in London said they had changed their journeys to work during the games, three quarters said they did not always travel to work the same way on a typical day anyway. Similarly, half of council employees in York revealed they could not be certain how many days they would travel in to the office in the following week. The study revealed that these variations were due to myriad reasons, from changing family and work schedules, avoiding bad weather or just feeling like making a change. But if there’s so much churn and flexibility in the system already, why is it so difficult to achieve deep reductions in car use? For these reductions to materialise, we need more people to avoid taking single occupancy journeys in their car more of the time, so that being “multi-modal” – that is, relying on more than one mode of transport – becomes the norm. But to achieve this, we’ll need a much broader understanding of how and what shapes people’s travel choices in the first place, and how this varies across locations and societal groups. The three-year disruption study suggests that we should think about these issues in terms of a broader “mobility system”. The mobility system includes not only the transport system (infrastructure, legislation, fiscal arrangements like charges and fares, and public transport operators), but also the communication system (patterns of work, shopping and socialising as well as the information we use on the go) and the social context (the norms about how things are done, the know-how and resources of those in the system, including workplaces and communities). At the centre of the mobility system are the activities which each generate travel and are influenced by the institutions and expectations in the system, such as school start and end times, or standardised business hours. Unfortunately, the supporters of car-free day – like most policy targeting transport patterns – fall into the trap of thinking that altering the transport infrastructure and services is all that’s required to alter travel behaviour. While these initiatives can play a role in changing the behaviour of some people, for one day, occasionally, it is far from adequate to influence longer term changes at the scale required. Instead, we need to make changes across the whole mobility system, to continually reinforce greater uptake of alternative transport methods. Flexible working hours, which relax rigid time and place constraints is an important part of the solution, as is wraparound childcare (such as before- and after-school clubs) to allow flexible schedules. Transport system solutions include payment systems to cater for multi-modal journeys such as the Mobility Mixx card in the Netherlands, which can be used to pay for all public transport, taxis, car pool, bike and car rental and park-and-ride tickets. Another option is seasonal reallocation of road space to pedestrian spaces or non-motorised road users as they did in New York. We need to think more carefully about how, where and when activities are carried out, and then look at how transport provision fits with that. Only then could car-free days go from being rare annual events to part of making non-car journeys more likely, more of the time. Jillian Anable is a Professor of Transport and Energy Demand at the University of Aberdeen.